An inflatable is an object that can be inflated with a gas, usually with air, but hydrogen, helium and nitrogen are also used. One of several advantages of an inflatable is that it can be stored in a small space when not inflated, since inflatables depend on the presence of a gas to maintain their size and shape. Function fulfillment per mass used compared with non-inflatable strategies is a key advantage. Stadium cushions, impact guards, vehicle wheel inner tubes, and emergency air bags employ the inflatable principle. Inflation occurs through several strategies: pumps, ram-air, billowing, and suction. Typical examples of an inflatable include the inflatable boat, the balloon, the airship, furniture, kites, and numerous air-filled swimming pool toys. Air beams as as structural elements are finding increasing applications. Balloons are inflatables. Smaller-scale inflatables (such as pool toys) generally consist of one or more “air chambers”, which are hollow enclosures bound by a soft and flexible airtight material (such as vinyl), which a gas can enter into or leave from through valves (usually one on each air chamber). The design dependence upon an enclosed pocket of gas leads to a need for a very durable surface material and/or ease of repair of tears and holes on the material, since a puncture or tear will result in the escape of the gas inside (a leak) and the deflation of the inflatable, which depends on the gas’s pressure to hold its form. Detectable leaks can be caused by holes (from punctures or tears) on the material, the separating of seams, the separating of valve parts, or an improperly shut or improperly closing valve. Even if an inflatable possesses no macroscopic leaks, the gas inside will usually diffuse out of the inflatable, albeit at a much slower rate, until equilibrium is reached with the pressure outside the inflatable. Many inflatables are made of material that does not stretch upon inflation; a notable exception of this is the balloon, whose rubber stretches greatly when inflated. The airship is usually inflated with helium as it is lighter than air and does not burn unlike hydrogen airships such as the Hindenburg. Inflatables are also used for the construction of specific sports pitches, military quick-assembly tents, camping tent air beams, and noise makers. Inflatable aircraft including the Goodyear Inflatoplane have been used. Inflation by dynamic ram-air is providing wings for hang gliding and paragliding. Inflatables came very much into the public eye as architectural and domestic object when synthetic materials became commonplace. Iconic structures like the US Pavillion at the 1970 Osaka Expo by Davis and Brody and Victor Lundy’s travelling pavillion for the Atomic Energy Commission popularized the idea that inflatables can be a way to build large structures with very extendend interior spans without pillars. These great hopes for inflatable structures would later be dashed by the many practical difficulties faced by inflatable buildings, such as climatization, safety, sensitivity to wind and fire proofing that, currently, restrict their use to very specific circumstances. The DVD Ant Farm has directions for making your own inflatables, using plastic bags and an iron. The low technological barrier to building inflatables is further lowered by DIY instruction sets like the Inflatocookbook. A patent was granted in Australia in 2001 for a “Manually portable and inflatable automobile” (Australian Patent Number 2001100029), however no known practical form of this type of inflatable has yet been commercialised. Large scale low-pressure inflatables are often seen at festivals as decorations or inflatable games. These are made out of rip stop nylon and have a constant flow of air from a blower inflating them. In some cases, an inflatable roof is added to an otherwise traditional structure: the biggest example in the world is currently the BC Place Stadium in Vancouver, British Columbia. Another example can be found in the Roman amphitheater of Nîmes. The original inflatable game was the Moonwalk (bounce house). Today there are a wide variety of inflatable games that come in all shapes and sizes. 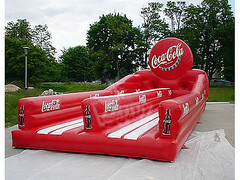 Many inflatable games put people in head to head competition with other people such as the bungee run and gladiator joust. There are also several inflatable obstacle courses available. Because of their large size, most obstacle courses consist of two or more inflatables connected together. There are also several variations on sports games which are made portable thanks to inflatables. A sports cage is an inflatable cage that holds up a backdrop that resembles a sport (e.g. baseball, American football, soccer, golf) in which you throw, toss, hit or kick a ball at a marked spot on the backdrop. The cage not only holds the backdrop but keeps balls from flying everywhere. Some sports cages come with a radar gun that will tell you the speed of your throw or kick. If you are ready to establish a party for kids, but also worried about selecting which games to make all the kids happy, Please write the inflatable games in your list, which will bring great enjoy in the party. As we know, it is difficult to handle the kids who under the age of 6 or 8 during the party. Because different kids has different favorite activities. when some of them get great happiness, others feel bored. Therefore, there should be such games decided for the party that every child enjoys and gets engaged. But, unfortunately many entertainment game cannot reach this requirement. 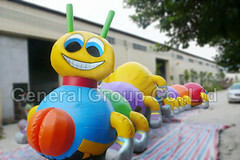 Recently, there are new games, called inflatable kids toy, which are popular and welcome for all kids. Because inflatable toys are available in many shapes and sizes and come with all the facilities like a large fan that fills up the ballooned inflatable toy in just few minutes. Children love to jump and play on it and fall on it and enjoy the whole thing, such as inflatable slide, inflatable house, inflatable pirate’s ships and many more. For example, the interesting inflatable obstacle courses always come along with unlimited themes, which will motivate the imagination and creativity of children. Additionally, you can have the inflatable bounce house, which is for jumping, hopping and sliding. With an unlimited range of inflatable toys it becomes difficult sometimes o decide which one to take. When you are planning a party for much younger kids then you can bring home many inflatable toys. But when little bigger kids are invited then it is advisable to bring the fun challenges that are included in one unit. They will love to play and meet the challenges involved in the toy. Finally, during the summer, If you are planning to have a pool in your backyard, please go for the inflatable pool for option. Also there are various inflatable pool toys which can be filled in few minutes with the help of air blowers. Since there can be a lot of pool toys in the house gradually but you need not worry about the storage and the use because they can be deflated and stored away in minutes. With a wide range of inflatable pool toys from colorful rings for kids and adults to float to dolphins and fluorescent balls you can have whatever you want. Find high quality inflatable kids toys and inflatable pool slides for parties in china, please visit www.inflatable-game.com! 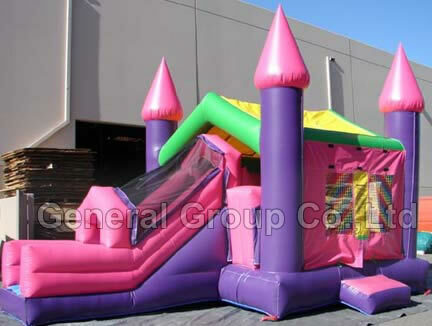 Maybe you are looking around for inflatable toys, Maybe you are interested in buying inflatable castle.if so, don’t miss our bouncy castles. With different shapes and forms, there are various inflatable castles, inflatable interactive toys and even inflatable water slides.Sleeping Beauty Castle will bring kids to a fairy journey.The most beloved snow white, seven small shorts, pince characters are seen everywhere.Beauty and Beast Castle, Disney castle, Cinderella castle,Space castle provide you limitless imagination and mysteries. 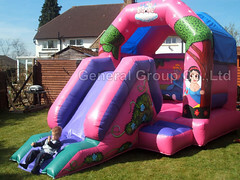 Encourage the children to play inflatable outdoor games! Recently, in the playground of amusement park and in the yard of the kindergarten, there are many large type inflatable toys, such as, the inflatable balance beam, arch, slippery slide and climbing stair, shakable rooster and horse, swing chairs, animal swing board and boats. Since these inflatable toys has large places and many children will participate the game together, thus this game can enhance the body strength and agility capacities of the children. Because this activity always require the coordination movement of all the body parts. It can cultivate and develop the community concept and cooperation ability of children. 1: when walking the inflatable balance beam, the adult should protect the security of the children and encourage them to stand up and balance the hands towards the two sides. After several practice times, it can improve the difficulty of this game, please out a book on the head of the child to walk on the beam! 2. 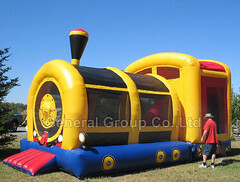 For the inflatable Arch, several children can play the game called “train drive from the cave”. The back child can grasp the clothes of the front child one by one. They orderly make a queue and walk or run through the arch again and again. If possible, they can sing the song or the sounds of the train to run though the arch! 3. When walk up the slides, the adult should encourage the children and even support them. When slipping down the slides, please let the child sat on the top of the inflatable slides and put two hands on the sides of the slide. Then let them slip down slowly. The parent will do the protection activity under the slides to encourage them to play. If there are several children, who will play the slide together. Please let them climb and slip the slide one by one, in case of collision. 4 When playing the climbing wall, please ask the children to put the feet, hands on the cross-stick of the climbing wall and let them grasp the cross-stick tightly. The children can climb it from the bottom to the top. during the climbing, the parent can protect them under the climbing wall and encourage them. thus the children can finish the climbing with great confidence! 5. 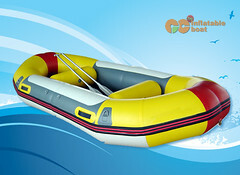 The inflatable swing chair and boat is suitable for waist movement. During the playing process, there are several children sitting on two sides of the boat and swing their up body towards front or back, which can make the inflatable boat swing! When one side of the boat is higher and the other side is lower, the children can change the direction of strength to swing the boat constantly! The parent can teach the children to sit in the boat orderly. Once the boat is swung, the child can not allowed to stand up, in case of the falling. The children, sitting on each side, should swing in the same direction, which can make the boat swing in balance!